Description: This small single-trunked tree is typically 10–30' tall in the wild, although in cultivation it may become 30–50' tall. The crown of this tree is usually as broad as it is across in open areas and densely branched, while in more shaded areas the crown becomes more open and elongated. However, small trees that are stunted from rocky barren ground often have a crown that is irregularly shaped and open. The trunk is up to 1' across and short; it is covered with nearly black coarse bark that is irregularly furrowed or blocky. The smaller branches and older twigs are more gray and smooth; they tend to be short and craggy. Young twigs are light brown with short brown pubescence toward their tips; the conical or bluntly conical buds are also light brown with short brown pubescence. Alternate leaves occur along young twigs; they are 3–7" long, 2½–6" across, and obovate or obovate-obconic in outline with 3–5 shallow lobes along their outer margins. The lobes of the leaves taper to tips that are obtusely angled, shallowly rounded, or bluntly square-shaped; each lobe has an exserted vein. The leaf base is narrowly rounded to wedge-shaped, while the leaf margins are irregularly undulate or slightly curved where the shallow lobes don't occur. The upper leaf surface is dark green, shiny, and sparsely covered with short brown pubescence that is stellate (star-shaped). The lower leaf surface is light-medium green, dull, and moderately covered with short brown pubescence that is stellate. Such brownish pubescence is especially common along the lower sides of leaf veins. The petioles are 3–12 mm. (up to ½") long; they are greenish white or pale yellow, and glabrous or with short brown pubescence. Like other oaks, this oak is monoecious with male (staminate) and female (pistillate) florets occurring on the same tree. The male florets are distributed along drooping greenish yellow catkins up to 5" long; each male floret (less than 3 mm. in size) has about 6 stamens, a short calyx with 4-6 lobes, and early-deciduous bractlets. The female florets are nearly sessile on the twigs; each female floret (less than 3 mm. in size) consists of an ovary with 2-3 styles, a calyx with 4-6 lobes, and several surrounding bractlets. The blooming period occurs from mid- to late-spring, lasting about 1–2 weeks. Cross-pollination of the florets is by wind. Afterwards, fertile female florets slowly develop into nearly sessile acorns that are solitary or in clusters of 2–3. These acorns take 2 years to develop and they don't become mature until autumn of the following year. Individual acorns are about ¾" long and ½" across, consisting of a rather deep cup with light brown pubescent scales and an ovoid nut that is smooth-sided, light to medium brown, and pointed at its apex. The cup extends along one-third to one-half of the length of the acorn and partially overlaps the nut. The interior of the nut is nearly white, meaty, and somewhat bitter. The woody root system of this tree produces a deep taproot with more shallow lateral roots. This tree reproduces by reseeding itself. During autumn, the leaves become dull yellow to red before turning brown; they have a tendency to persist on this tree during the winter. Cultivation: The preference is full sun, dry-mesic to dry conditions, and barren ground containing sand, gravel, clay, and/or rocky material. This tree grows slowly and can live up to 200 years. Range & Habitat: Blackjack Oak (Quercus marilandica) is native to southern and west-central Illinois, where it is occasional (see Distribution Map). Elsewhere within the state, it does not occur as a wild tree. Illinois lies along the northern range-limit of this tree; it occurs primarily in the southeast and southern plains area of the USA. Habitats include upland rocky woodlands, rocky outcrops, thinly wooded bluffs, upland sandy woodlands, upland sandy savannas, sandstone glades, limestone glades, shale glades, edges of sandy prairies, and abandoned fields. Blackjack Oak typically occurs in drier areas of oak-hickory woodlands and savannas; in sandy areas of Illinois, it often occurs with Black Oak (Quercus velutina). Blackjack Oak is often top-killed by wildfires, but it can resprout from its roots. In Illinois, it is usually found in higher quality natural areas. 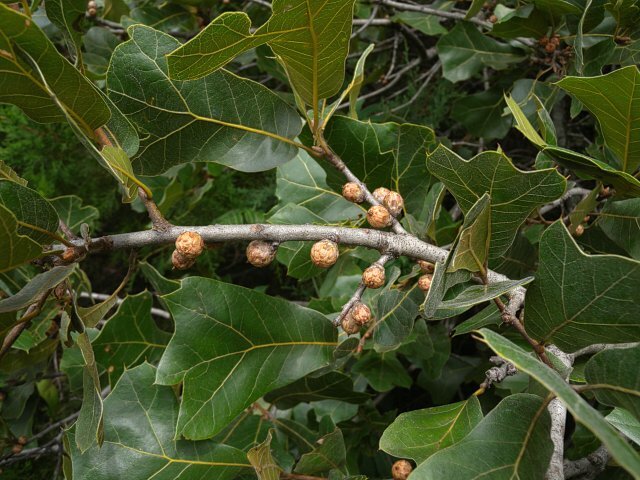 Faunal Associations: Like other oaks, Blackjack Oak (Quercus marilandica) is a food plant of many insects. 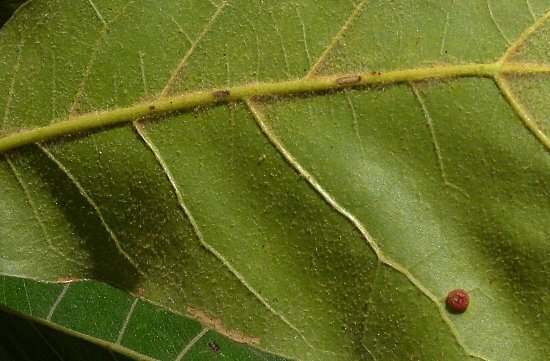 Examples of insects that are known to feed on this oak include leaf beetles (Metachroma laevicolle, Xanthonia striata), nut-feeding larvae of weevils (Curculio humeralis, Curculio longidens), aphids (Myzocallis punctatus), armored scales (Melanapis obscura), leaf-mining larvae of moths (Nepticula quercipulchella), and leafhoppers (Eratoneura spp.). 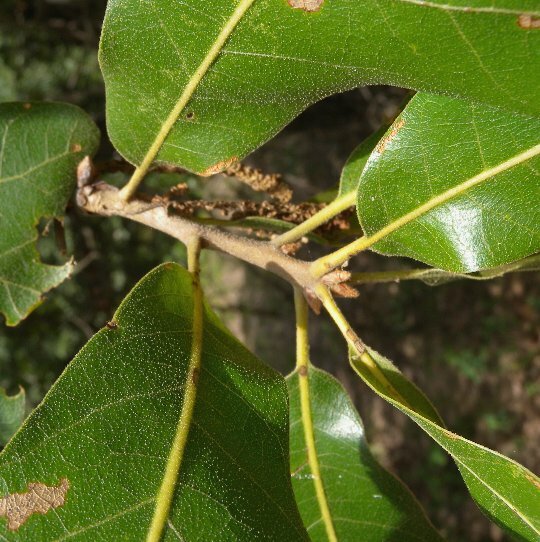 In particular, Blackjack Oak is a preferred host plant of the leafhoppers Eratoneura havana, Eratoneura marilandicae, and Eratoneura tenuitas (Clark et al., 2004; Gibson, 1985; Hottes & Frison, 1931; ScaleNet, 2014; Needham et al., 1928; Dmitriev & Dietrich, 2010). Other insects that feed on this and other oaks include the larvae of wood-boring beetles (Buprestidae, Cerambycidae), the larvae of bark beetles (Scolytidae), treehoppers (Membracidae), the larvae of sawflies (Tenthredinidae), the larvae of skippers (Hesperiidae), the larvae of Hairstreak butterflies (Lycaenidae), walkingsticks (Diapheromeridae, Pseudophasmatidae), and the larvae of hundreds of moths (Geometridae, Noctuidae, Saturniidae, etc.). Among vertebrate animals, the relatively small acorns of this tree are eaten by such birds as the American Crow, Blue Jay, Tufted Titmouse, Bobwhite Quail, Wild Turkey, Greater Prairie Chicken, Ring-necked Pheasant, Red-headed Woodpecker, Red-bellied Woodpecker, and Passenger Pigeon (now extinct). Mammals that feed on the acorns include the Gray Fox, American Black Bear, White-tailed Deer, Raccoon, Eastern Gray Squirrel, Fox Squirrel, Prairie Vole, and White-footed Mouse (DeGraaf, 2002; Martin et al., 1951/1961). This small tree provides good cover for birds, mammals, and other wildlife. Photographic Location: A sandy savanna and edge of an upland sand prairie at the Sand Prairie & Scrub Oak Nature Preserve in Mason County, Illinois. Comments: With the exception of the Dwarf Chinkapin Oak (Quercus prinoides), this is the smallest oak in Illinois. 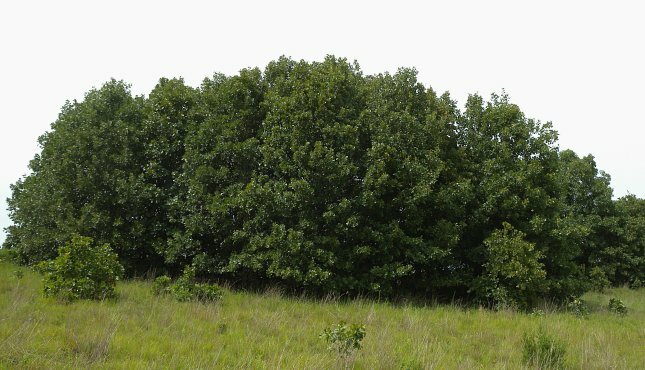 Blackjack Oak is rarely cultivated, but it is able to adapt to harsh dry environments of various kinds. This oak can be easily identified by its small size, the unusual shape to its leaves, and the short brown pubescence on its young twigs and leaves (especially the undersides of the latter). 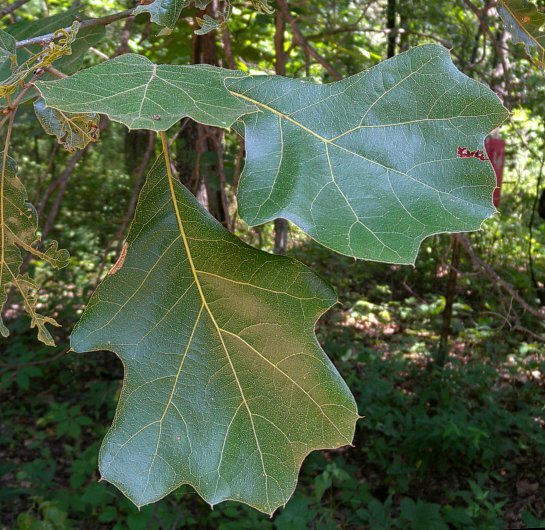 This oak is known to hybridize with many other oaks species in the Red Oak/Black Oak group, and such hybrids are common, causing irregularities in the shape of its leaves. The purest strain of Blackjack Oak has leaves with only 3-5 lobes and those lobes are obtusely pointed, rather than rounded. When this oak hybridizes with other oaks, such as Post Oak (Quercus stellata) or Black Oak (Quercus velutina), the leaves will have more rounded and abundant lobes. 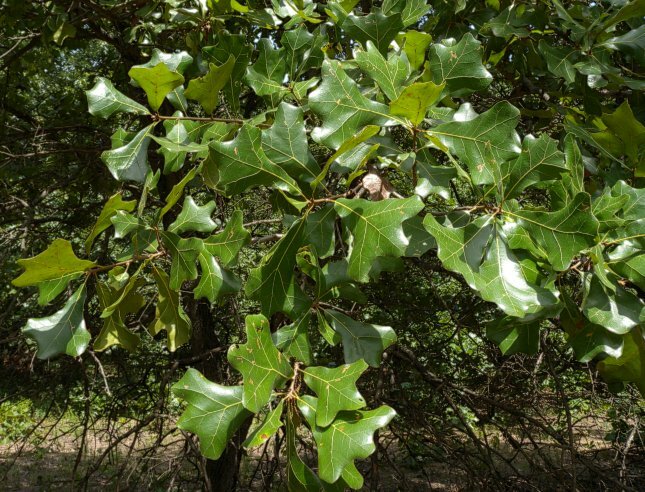 The photograph of the leaves for the hybrid Bush's Oak (Quercus marilandica × Quercus velutina, Quercus × bushii) shows what such leaves look like.